A local franchisee played the waiting game during the recession. Today, he is on a building spree, a tribute to the recovery of the Las Vegas market. Nick Nasrollahi, who is the franchisee with five locations with Checkers and Rally’s Restaurants Inc., is adding two stores in the Las Vegas Valley by the end of the year. “Just like everybody else, we had a good two to three years of wait-and-see,” said Nasrollahi. 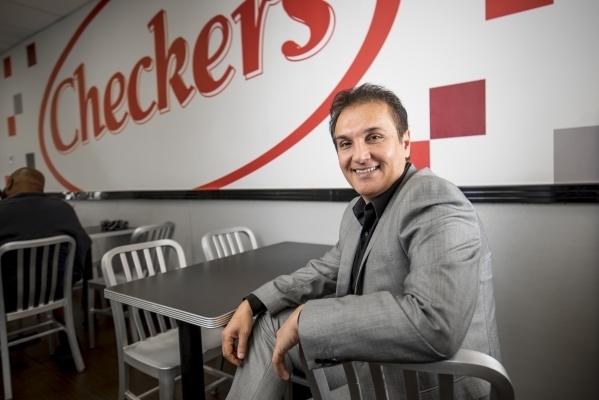 By the end of November, Nasrollahi and his partner David Meldrum will be able to offer Checker’s lovers a new location at Belmont Street and Las Vegas Boulevard North. And by the end of the year, another store will be ready to go at Harmon Avenue and Paradise Road, Nasrollahi said. The team originally contracted with the Checker’s brand to bring up to 20 stores to Las Vegas and built their first location — on the valley’s east side at Boulder Highway and Desert Inn Road — in 2009. That’s where things came to a halt. In 2012, Nasrollahi and Meldrum were ready to press play again. They would amass four more locations, from the southwest to the north valley, over the next couple of years. Nasrollahi has spent his entire career in the fast-food industry, but that wasn’t part of his original plan. He started out in college working on a computer science degree, and his side job was working in fast food. Management saw potential for him in the industry and pushed to recruit him. Nasrollahi would eventually come to the decision to stay on. He also continued his education but switched to business management. He would move from his Los Angeles home to the Las Vegas Valley in 1996. Nasrollahi said he worked for Jack in the Box Inc. at the management level in Las Vegas. He helped the company open 40 stores around the city, he added. Meldrum, Nasrollahi’s business partner, is retired from his career as a certified public accountant. He was living in North San Diego County before moving to Las Vegas but was born in Detroit. The duo first discovered the brand through the business news. Nasrollahi was also attracted by Checkers’ drive-thru concept. The restaurant is known for its double-drive-thru. When the team’s first store hit the Las Vegas market, it was a success. “As we opened in more locations, more and more people knew about it,” said Nasrollahi. The local market isn’t the only one on the move right now. Jennifer Durham, vice president of franchise development at Checkers and Rally’s corporate, said the brand will welcome 40 to 50 new stores nationally this year and between 50 and 60 more in 2016. Durham says she wants to see the brand make it to about 5,000 stores. Nasrollahi said he wants to put more stores up as well, but it all depends. There are some positives to investing in the Checkers brand. “We have the lowest initial investment of all the burger brands in the quick-service restaurant space, and that makes us very different and unique in that way,” said Durham. There are also other pluses to becoming a franchisee. By the numbers, a franchisee has to have $250,000 in cash and another $500,000 in net worth to be considered, less than half the requirements of some of the major competing brands. The contract length for Checkers’ franchisees is 20 years. And there’s a one-time $30,000 franchise fee per location, along with an annual 4 percent royalty fee on net sales. The Checkers brand began in 1986, just a year later than Rally’s — a burger restaurant that also had a double-drive-thru concept. In 1999, the two brands merged, making it the largest double-drive-thru chain in the U.S. Today, there are more than 800 stores across the country. The Rally’s brand was kept in certain markets, though the food is sourced from the same place and the menu is identical, according to the Checkers website. The initial investment in the brand ranges from more than $155,000 to nearly $1.3 million according to the Checker’s website. The average investment is just over $400,000, the website said. Nasrollahi had some extra costs on his initial investment on his first location at the southwest corner of Boulder and Desert Inn — it was once a gas station. Nasrollahi said the cleanup set him back around $200,000. Beyond the numbers, Nasrollahi wants to offer the community something as well. Checkers has brought about 150 jobs to the Las Vegas Valley. The average amount of employees per store is 25. That number could grow with the possibility of future restaurants. “We would still like to have 20, but it all depends on the condition of the economy,” said Nasrollahi.